I was spending a week in Huntsville with my Uncle. We went on hikes and ATV rides every day to explore the nature. We saw many birds. The salamander or newt caught my eye as well as the red squirrel. 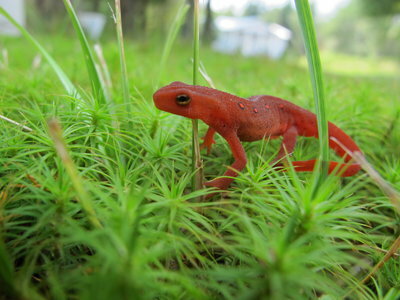 I have never seen such a bright red/orange newt before. We were feeding the red squirrel nuts.